At deBebians, we apply strict quality standards to all of our diamonds. We offer a wide selection of traditional round diamonds, as well as fancy diamond shapes. All of our certified loose diamonds are graded to have D-J color, FL-SI2 clarity, and excellent, very good, or good cut. Our signature Vault Collection offers the finest quality round diamonds available. Unique characteristics determine quality for each diamond shape. This primer will assist you in understanding the key diamond attributes to consider when shopping for a particular diamond shape. Please do not hesitate to call us if you have any additional questions. Our GIA graduate gemologists can be reached by phone at 877-472-2700 (domestic) or 213-627-1300 (international) during regular business hours. All the fancy shapes sold on deBebians have a length to width ratio, which is the length of the stone divided by the width of the stone, when measured facing up. The ratio number is an easy way to determine how square or rectangular a diamond appears. A perfectly square diamond — a key factor for selecting square diamonds like princess or Asscher diamonds — would have a ratio of 1.0. 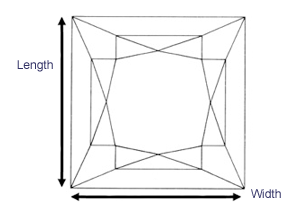 As the ratio increases, the diamond becomes more rectangular, such as a ratio of 1.3. The length to width ratio can be found on the loose diamond's product page under "Detailed Diamond Specifications." Below, we have provided sample images of how different shapes of diamonds would look like at different ratios. Round diamonds are the most popular and most traditional. Select a round diamond from our signature Vault Collection or with an excellent or very good cut grade to maximize brilliance and sparkle. The deBebians Vault Collection features the very best round diamonds available with ideal depth and table percentages as well as excellent polish and symmetry, certified exclusively by the Gemological Institute of America. 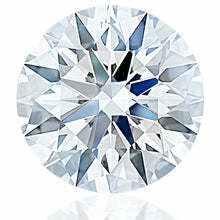 Round diamonds are also more expensive than the fancy cuts shown below. Click to shop round diamonds. Princess is the second most popular shape after round and is typically square in shape with pointy corners. When shopping for a princess diamond, length to width ratio is an extremely important factor. A ratio of 1.0 indicates that the diamond is perfectly square. A ratio above 1.06 will start to look rectangular, so for an ideal shape choose one with a ratio between 1.0 and 1.05. Click to shop princess diamonds. Emerald diamonds feature step cut faceting, which means there are long facets that run the length of the diamond. This type of cut accentuates the diamond's clarity, whiteness and lustre, and therefore it is much easier to see into an emerald cut diamond than a brilliant cut diamond. When selecting an ideal emerald diamond, choose a clarity grade of VS2 or better and a length to width ratio between 1.30 and 1.40. Click to shop emerald cut diamonds. Oval diamonds display beautiful brilliance comparable to round diamonds. However, oval diamonds show body color more than round diamonds, so selecting a whiter stone is key. When set as the center stone of an engagement ring, an oval diamond can help elongate the wear's fingers. For an ideal oval shape, select one with a length to width ratio between 1.33 and 1.66. Click to shop oval diamonds. At deBebians, the cushion diamond is one of our personal favorites. The shape of the diamond resembles a pillow, which is why these diamonds are sometimes also called pillow cut diamonds. The shape of the stone can range from square to rectangular. Your personal preference should dictate which type you opt for. Click to shop cushion diamonds. Asscher diamonds are named after Joseph Asscher, who designed the original Asscher cut in 1902. Essentially square-cut emerald diamonds, Asscher diamonds feature step cut faceting and are much easier to see into than other diamond shapes. By definition, all Asscher diamonds are square and the length-to-width ratio will be 1.0 with very slight variances (such as 1.006). For optimal results, select an Asscher diamond with a clarity grade of VS2 or better. /a/diamondsearch/" class="top_links">Click to shop Asscher diamonds. Radiant diamonds, another deBebians favorite, feature cut corners and can be either square or rectangular in appearance. Like the princess cut, radiant diamonds are also considered a mix cut. Shown here are some examples of what radiants of various ratios look like. Both square radiants and rectangular radiants are beautiful and, as to which one is better, it's all personal preference. Click to shop radiant diamonds. The heart shape is perfect for romantics, so it can be a lovely piece for any romantic occassion. Be careful when selecting a heart diamond, because length to width ratio is critical. For a typical heart shape, we recommend choosing one with a ratio between 0.90 and 1.10. Here are some examples to help give you an idea of what various ratios look like. Click to shop heart diamonds. Known in French as a navette diamond, meaning "little boat" for its shape, the marquise diamond is a modified brilliant cut. Marquise diamonds can appear larger than other shapes of diamonds of similar carat weights, giving you more bang for your buck. Like oval diamonds, the marquise shape accentuates long, slendar fingers. An ideal length to width ratio for a marquise diamond is between 1.70 and 2.25. Click to shop marquise diamonds. A hybrid between the marquise and round diamond shapes, pear diamonds feature a unique teardrop shape. Pear diamonds appear larger face up than other diamond shapes with similar carat weights, a favorable attribute also shared by marquise diamonds. Like oval and marquise diamonds, the pear shape helps to elongate the wear's fingers. The ideal length to width ratio is between 1.50 and 1.75. Click to shop pear diamonds.